- The date is stamped on the front right corner of the tank. 67 has a calendar week code. 16 D 7 would be the 16th week of 67, day shift. 40 6N would be 40th week of 66, night shift. - The format changed in 68 and 69 to have the week counted from the beginning of the model year. The extended 69 model year used tanks dated for the 70 model year. I recently read a discussion topic relating to gas tanks. In the discussion, gas tank date coding and design of the seam stitching was mentioned. This prompted me to get my original tank out of storage and look for the date code, study the seam stitching, and compare the original bends in the flange versus those on my reproduction tank. 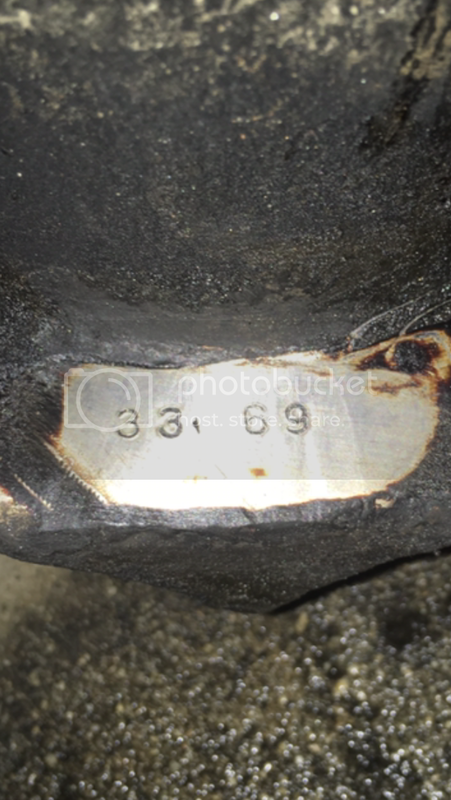 The following pictures show the date code and its location. I would like to confirm the date code "37 69", which I assume March 7, 1969. My Camaro was assembled "05A", or the first week of May. For those of you with a 1969 survivor, or your original tank, what is your date code vs. the build data of your Camaro? If your tank is date coded in the same location as mine, you’ll find it stamped on the passenger side, rear corner flange, facing downward and visible from the bottom of the car. Does anyone know of a shop or an individual that restores original gas tanks? I need to have a few minor dents removed, and prefer to have the tank exterior re-galvanized back to its original look rather than use the “tank tone” paints available? I plan to consult with local paint less dent removal companies about removing the dents. I just had the tank out of my 01C Norwood built RS this past Oct as a part of the restoration of the rear undrcarriage. The tank was totally cleaned, stripped, sealed, etc. 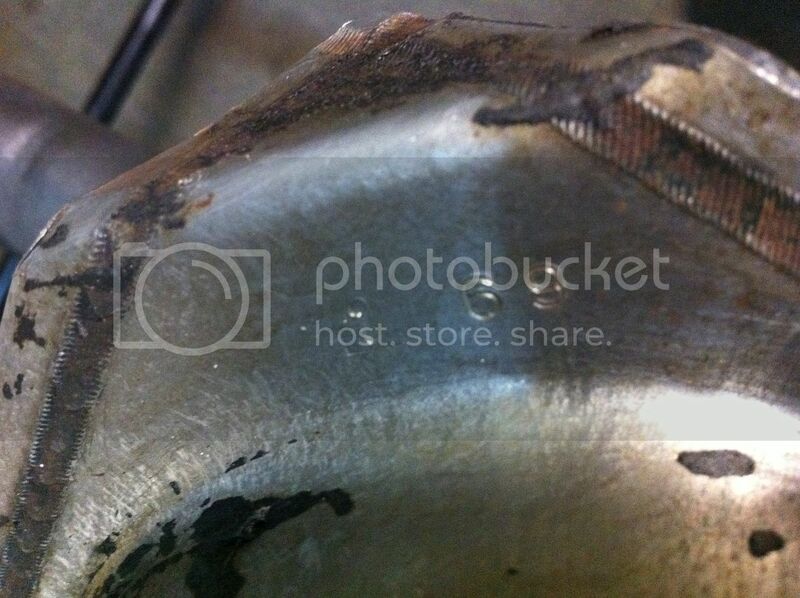 I have rechecked the pictures I took as well as taking another look under the car at the tank. There were no stampings or date codes anywhere on it. Sorry I couldn't provide any helpful info. 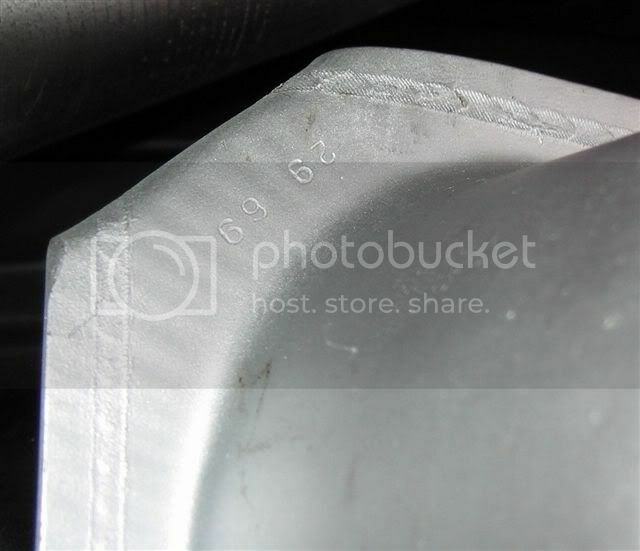 If your tank is date coded in the same location as mine, youll find it stamped on the passenger side, rear corner flange, facing downward and visible from the bottom of the car. In the second photo, it appears to be on the front corner on the driver's side, not the passenger side? Found mine right where John Z. said, front corner, drivers side. The date appears to be 2 4 69 with the 4 stamped upside down. Anyways the car is 06A build. I brought this up in the other thread. The survivor judges at the show said it was year and day, no month. Not sure how correct that interpetion is, especially now seeing others, but my car is a 12D 68 and stamp is 68 20 so go figure. They also had a original 69 Baldwin Phase 3 car at the show this year and the tank had an extra number in there, was like 69 8 28 if I remember correctly. They were all scratching our heads at that one. And yes, drivers side front corner. So I'm curious, how did your reproduction tank compare to the original? Based on your gas tank date code (68 20) it looks like the year and Julian date is the correct format. They wouldn't have dated something February 0. Our gas tanks were made one week apart (my tank date code is 68 27) on a Saturday! January 27th, 1968 works for my 02C car, but I'm curious what the judges had to say about your tank's date code (January 20th, 1968 for a 12D car). Did they think it was mis-stamped? Replaced? Or? Sorry everyone....I glanced at my picture and described the location incorrectly. Thanks for the correction. It is kind of cool to uncover some new date code on a part. Again, I read about date codes on tanks on CRG then had to get my old original tank out to see if I could find the date code. My goal was to uncover some common date coding on tanks versus the build date of our Camaros. Hopefully we can uncover more on this topic! PS: Much to my wife's dismay, I am glad that I am a "pack rat" and never throw any of those "old, rusty and dirt parts" stored in the attic. The repro tank appears identical except for the bends in the mating flange. It is hard to get good pics of the repro tank installed my car to clearly show the difference. Attached are a couple pics of my original tank showing the bends. If you by a repro, hopefully you can use these pictures or your original tank to compare. I restored my car back in 1995 – 2000, so better quality tanks may now be available. What did you use to strip and seal your tank? I thought about using paint stripper on my, then try to buff it back to the approximate original look then clear the tank with a satin clear. Here is one more pic of my original tank to see the bend in the flange. There were no stampings or date codes anywhere on it. I stand corrected. Took another careful look under the car at the tank and sure enough, on the LH (driver) side front corner on the bottom the tank is coded 22 69 (Julian date; i.e. 22nd day of 1969), which would be consistent with my 01C Norwood build. All four numbers are very lightly stamped. The 69 is barely visible, but it is there. Stamping is so light I never noticed it before, even after detailing the tank. See attached picture. Another great example of how this forum brings knowledge to us all. My tank (original to the car) was covered with dealer undercoating. It is a mess to get off. Several applications of airplane paint stripper (available at WalMart), some scraping to get as much off as possible, then I went over the entire tank with a wire wheel (actually about 3 wheels) to get the tank completely stripped down to bare metal on the outside. First picture shows the tank after it came out of the car. Second picture shows the tank after stripping and wire wheel cleaning. Picture in following post shows the tank ready to go back into the car. The inside of my tank was rust free and in very good condition, so I rinsed it out and then chemically cleaned and sealed it with a product from Eastwood. Outside of the tank was finished off with a zinc oxide tank tone paint, also from Eastwood. The attached pic is after the tank was finished. First Question I have is...Does 67's have date codes? Where? If not, should I restore the original or replace it with repro?? I think I know the answer.....here comes more work and cost...aarrrgggg. Although the vendors love to sell parts that never existed, insulators were never used between the tank straps and the tank on any 1st-gen Camaro; they were only used between the top of the tank and the underbody. I have an old GM tank on my car I bought years ago-there's no stamp on that tank for whatever reason so it was considered replaced but GM. I guess they only stamped the production ones? I'm not about the date code format though, my impression of their explanation was it was year & day but day could be of any month. It didn't make sense to me then and defiantly doesn't now seeing a 37 for a day...but I have also never seen anything other than a 2 digit code in the second part either. If it was Julian, there obviously would be 3 digit codes. Weeks would make more sense for the code format, but that would put a lot of the posted codes after the build date of the cars-and still leave my tank WAY early so I have no idea how to decipher the code. 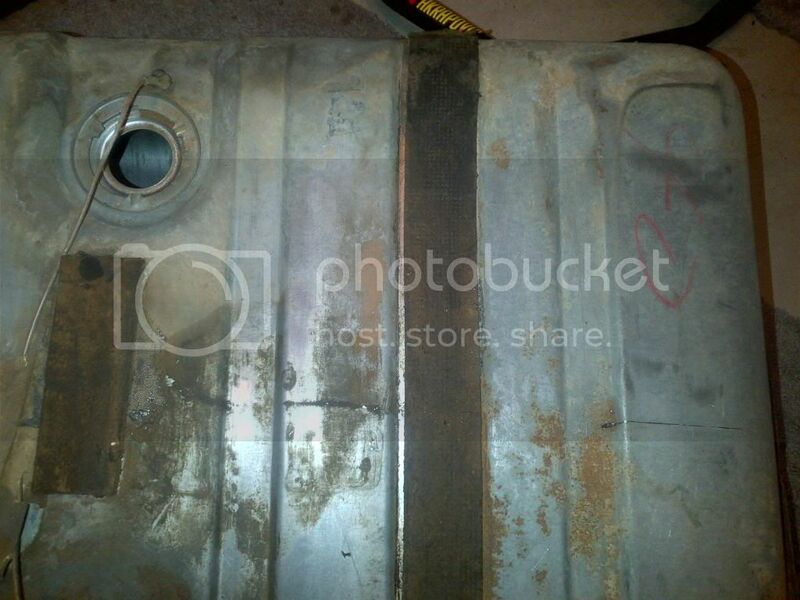 Just to add input, I looked at the tank I removed from my 07D '68'. Same location as the others and stamped 68 52. Hope this helps, RonM. OK, what's CRG's input on the gas tank date code debate? Are all of the original stamps only four digits? What does CRG believe to be the correct way to decipher the code? Well, let's compile the data. I dug out my tank and added it to the mix. I think the code is a running week date, starting at 01 about August and incrementing throughout the model year. More data would help. Anyone with an early 68 or early 69 car (Aug-Dec) that can add their tank date? Thanks Kurt! I knew you would have a theory. I did a quick search over at Team Camaro. "Gary L" has an 02D '69 Z/28 with a gas tank date code of 29 69. I've added his data* above. Added mine from 68. The running week theory seems to work out so far. This thread has been interesting. I never knew it was stamped. Anyone else not checked in yet that can confirm thier origonal tank? I think it would fall in line with the other dates we are seeing if you consider the 2 being upside down instead of the 4. Then it would read 69 42 and fit with the rest of the data. After all 69 is the same either way you look at it. That's my tank and I was wondering the same thing. Here goes my first attempt at this forum..... since you were looking for an early production '69 you made me go look (never checked before). Learn something new every day !! Thanks guys for the additional data! I didn't have one until I compiled the data. You forced me to come up with one. I would agree the 06A tank either sat for a while or is misstamp. Interesting. Since they had the year on the tank, they could just keep counting - higher than 52 wasn't a problem. Thanks for figuring it out Kurt! Kurt you rule!!!! Thought it was a week but didn't make sense with the Calendar year...Production year...DUH!!!! Here is the latest list with the 06A Flipped around assuming the 2 was upside down instead. Seems to make more sense. Funny how every once in awhile a digit on a part is reversed or upside down. I never realized how common these types of issues were until reading alot of these posts. Just to add my input, I looked at the tank I removed from my 69 05E, stamped 69 41. It was interesting to figure out. Not a lot of data, but it was Pex's 12D data was problematic and important - the wrong calendar year for a 12D car. The Tank is out of the car and I cleaned both rear corners top and bottom. I used lacquer thinner to clean down to bare metal and nothing. Could it be somewhere else on a 67?? CRG should be taking note of the info gathered in this thread and make a paper on it. FRONT drivers side facing ground as installed! Sorry, I mis-spoke, I had done the 2 front corners top and bottom and nothing is there. I wanted to send my information on my gas tank code. I'm not sure which direction to look at the code. early Los built 69 Z with a build date of 10D 1968. What does the tank decode to? Buddy, did you check the other corners and all along the seam? That's the only place it could be since the stamp was like clamp it needed a flat surface to "clamp" on to. Let us know. So I guess we need also to get some other 67 guys to chime in here to see what's up with 67 tanks...dated or not and where? My original tank is out of my car and I hunted around last night and found the numbers. My car is a 69 Z/28 03D build date and the gas tank date code is 45 69. My tank leaks in the right front corner of the tank. 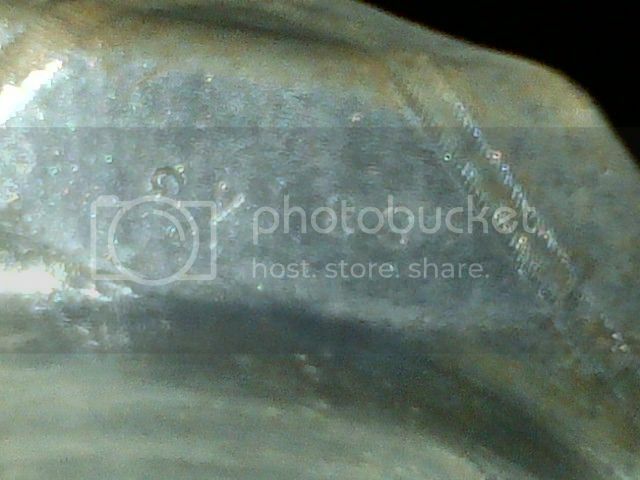 Not on a seam but through the metal itself. Weirdest thing it looks like there are a bunch of tiny holes grouped together and the gas just seeps through there. I would like to restore the tank and use one day. Does anybody know of a gas tank restoration shop? 35 69 looks better. Else I'd say your tank has been replaced. Nice to see some late data! Not a huge surprise since it was almost a 1970 model, but I wasn't sure which way they would have done it. Wouldn't surprise me to see pattern differences between NOR and LOS cars; the tanks at Norwood were made at Chevrolet-Flint Bristol Road Stamping, and the tanks for Van Nuys cars were sourced to an outside supplier in California instead of shipping rail car loads of "air" across the country. That California supplier also made the "B"-body tanks for Van Nuys and for the South Gate plant across town. 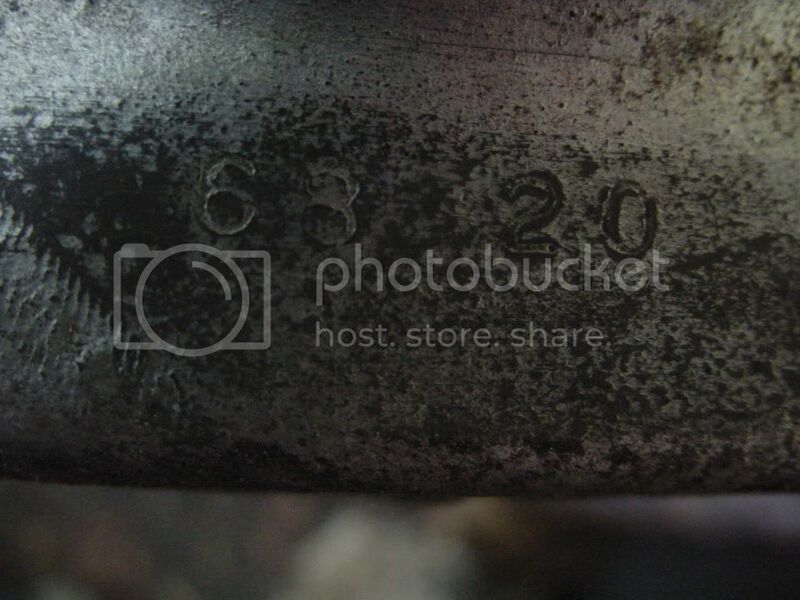 So it seems gas tanks were stamped for model years and not year of manufacture. As in my case where I have a Los built 69 Z with a build date of 10D 1968. Though the gas tank stamping is 10 69. Here is my date code. The tank does not look like it was replaced because it has under coating all over it that matched what was under the car? But of course I dont know for sure. Here is a shot of my code on my 1969 car. It is an 11D 1968 build. Here's another 06A car but is one of the last built June cars, vin 6647XX. Tank numbers 69 45, picture attached. Where on the tank was it stamped? I would like to know myself, still haven't found mine. Pictures would be very nice. I agree with you, I think mine was replaced too. Based on the dates. I guess the dealer smeared the undercoating on the tank? The code is stamped on the front RH (driver's side) corner flange of the tank. You will need to remove any paint or rust to expose the date code. The code is stamped on the front RH (driver's side) corner flange of the tank. I finally took the time to to check the other tank I have access too. It is an 11D date code and the tank has a 69 51 stamped on it. I notice others have one upside down number on their tanks. It could be that the 5 and the 1 were installed backwards and should have been 69 15 which lines up better with other submitted info. On my 02D car I always thought the 29 69 meant the 29th day of 1969 which fits with a 02D build date. But that is obviously not right. My guess is it refers to the 29th week of gas tank production for 1969 production and probably started at the end of July or beginning of August 1968. Sorry...yes, it's the "LH" or "driver's" side of the tank. I just got the date code off my 04A Norwood '69: 33 69. The number seems to fit well with previous reports. Still do not see a date code on my 67??? When did they start date coding the tanks?? Interesting that there are no 67s listed yet. Anyone have a 67 with a date stamp? There was one 67, but no updates on the stamp location. My 03E '69 is 33 69. I guess the 67 did not have codes at this point? I know right?? And nothing before my 12D 68 20 stamp? I'm amazed! So what, early early 68's didn't get them either??? Fall E-town car show next weekend, guess I'll have to wear a crappy shirt because I can already see I'll be crawling under every 67 & early 68 I see to see if there's codes Don't worry, I'll have my camera!!! More data: My 01C is 21 69. OK OK OK OK I think we have enough data to decode tank numbers. Aug 1 of production year was week 01 and Last week of July would be 52 or 53! I disagree, the more data the better. Especially for the '67s. Would be nice to narrow down the change in date formats as well. Can never know too much. Quite clear stamping. Used wire brush too. I completely agree. Having more data can only help to educate everybody. You never know there could be exceptions to the rule/norm and we will only ever find out by continually researching. Just pulled my 68 Z/28 04A gas tank out of storage and found the date code, it is 68 37! Please add to the list, thanks. Found this post so I am adding my date code as well. Dropped tank this past weekend and found 41 69 on my 06A Z28. What's the production month? Thanks! Thanks. The one thing that stands out is the Astro Vent glass. Are you sure that's not a sticker? What's the date? Data compiled below. Looks good, though more 67 and early 68 data would help. My 11A - 66 LOS built coupe has 40 6N right on the bottom of the Drivers corner. This 40 would be correct for actual Calendar week, but not with the theory that Aug. 1 st. being week 1. And wonder why the N is at the end. I'm attaching a pic. Thanks guys! So it looks like 67 has a calendar week code. 16 D 7 would be the 16th week of 67, day shift. 40 6N would be 40th week of 66, night shift. The format changed in 68 and 69 to have the week counted from the beginning of the model year. Nice job, Kurt the Code Cracker! The gas tank code is 5 70 . I was thinking it must have been repllaced before I purchased it in 1976, if it wasn't made until 1970?? but I notice several other 08 and 09 cars with 70 dates. So how does this code work for the extended-run late '69 cars?? It still uses the '68-'69 format, but begins 1 70 when the '69 model year should have ended but was extended because the '70 Camaro was not ready for release. Your gas tank was built in the fifth week of the 1970 model year and IMO is original to your car. I'm new here and just a lurker learning after having my car sit for almost 25 years garaged and decided to get back into this. I checked on my (what you now call a survivor car) 67 SS/RS 396 LOS car I bought in 1980 from the original owner and see a 4N7 on the gas tank. The body tag is 04B. I see the tank was sprayed black and I thought the owner did that but I read somewhere recently that LOS Camaros had black tanks. My tank is the first 67 on the list(40 6D) with the pic. above 11A build LOS coupe, there was no paint on my tank. Mike, I've seen other LOS tanks with blackout on them. I think there's a pic showing the plant painting the tank. I do see what appears to be black on the left side of your posted image. Could that be what remains of the paint if your tank was painted? I wonder of early LOS Camaro tanks were painted. You are right, I went back out and dug out that Tank. As you will see it has a bad dent in the Pass. front corner, I was trying to get out, with no luck. I also found a small leak in the process. So I am thinking of replacing that Tank, too bad!!!! It does have Black paint, just on the bottom, and it looks to have been "brushed" on. (and after the straps were in place) I guess I had just considered it a "backyard" detail job. Sorry! I am attaching a pic.! I have an original tank in my car and it is covered with a really thick coat of dealer installed undercoating. Its a Canadian car with the undercoating option on the options sheet. Should I remove the undercoating or keep it that way? I am not crazy about the look. It is just a 6 banger car. I would like to have a nice clean tank as the cars has just been painted. 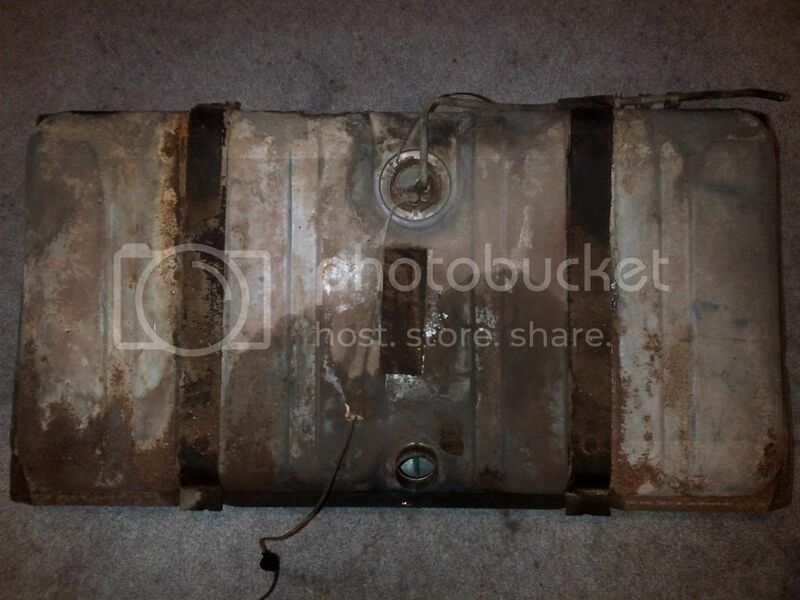 I have a new tank I can install, but is there any point keeping the original and does anyone care if this car retains its original tank. I was thinking of saving all of the orginal parts since this car is very original currently. Pretty well everthing for the most part is original except tires, paint, front windshield, some hoses and hose clamps etc. The tank on our 67 2E L-35 coupe reads 7 D 6 It's a Norwood car. Having trouble loading a picture,will keep on trying. Is that the way it was done at the factory? It looks to be a thicker paint brushed on? After the tank and straps were in place? Here is the photo of our gas tank. Thank goodness for Grandchildren and their unlimited computer skills. It looks like my tank was sprayed with the straps on. The bottom is fully covered along with the the upper side above the seams. Updated compilation. 67 has a calendar week code. 16 D 7 would be the 16th week of 67, day shift. 40 6N would be 40th week of 66, night shift. The format changed in 68 and 69 to have the week counted from the beginning of the model year. The extended 69 year used tanks dated for the 70 model year. Geting resdy to toss my original tank. It is 29 69 for my 02D Z/28. Sure wish they could be made to look good again. GaryL... what is so wrong with you tank that it cannot be saved? You can chemically clean and then seal the interior. you can bead blast, clean and then spray the outside with galvanie paint.. you can replace the sending unit, filter sock, etc... so why can't you 'make it look good' again? Our 02A X33 car's tank is dated 2 upside down 5 69. Not sure if I added this info. previously or not but did not see it in Kurt's latest list. Unfortunately, in order to save the chassis broadcast copy, I ruined the tank (had to cut it out). The format changed in 68 and 69 to have the week counted from the beginning of the model year. The extended 69 model year used tanks dated for the 70 model year. LMK if you need a picture. Took a wire brush to my tank. I added a summary to the first post of this thread. Here's the updated compilation. 67 has a calendar week code. 16 D 7 would be the 16th week of 67, day shift. 40 6N would be 40th week of 66, night shift. looks like it would be the original, congrats and welcome to the CRG! Here is a Pic of my tank. Car is 11C. It does not seem to match the tank chart. Thanks Kurt, that would explain the mystery. I could not make out the first 1 at all. Shot pics of tank, straps today if anyone is interested. I've re-painted the tank silver now, with black straps, but when I paint stripped it, the tank appeared to have (under a few coats of overspray) original factory black paint. Just pulled the tank from an 01B of 1969 VN coupe and it's stamped 21 69. Here's a '67 for the list. Just pulled the tank last weekend on my '67 LOS 11A car. Code is 42 9D which doesn't seem quite right given the number 9. Could it be upside down and should be a 6?. Referencing some other posts - the other 11A car listed (40 6N) I believe is very close in production to mine - so go figure? Vellu same code as my 08C, good to know it was pretty uniform. Meant to attach this for reference. Chris, now that you mention it, yes I do remember some posts back and forth. Wow, 430 cars, that is close. As for the # in upper right corner, Nov. 1st. was on a Tues., so your # starting with D should have been Fri. of the same week. But the 430 they could have built in 1 or 2 days. Yours had more options so maybe it got held up a little. 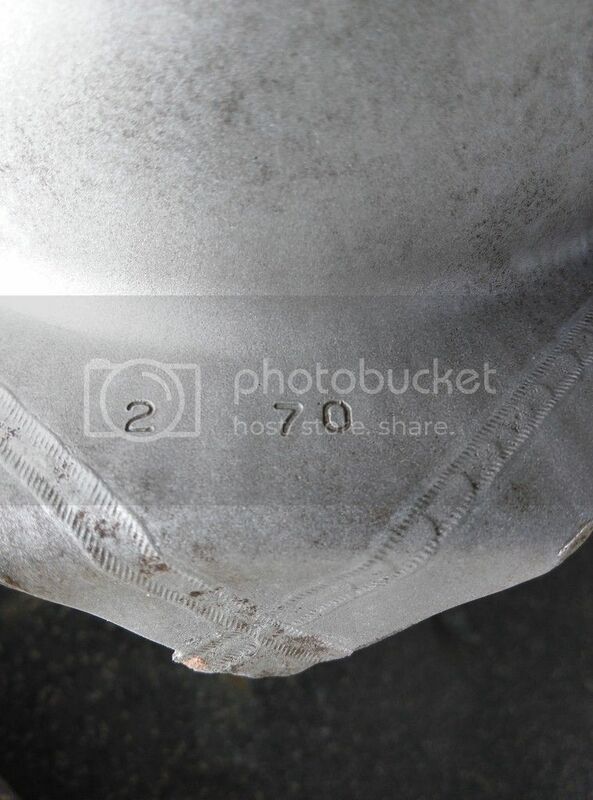 Not sure if it is relevant anymore with all the gas tank codes already in the database, but I got finally around to looking at the gas tank code of my 67 03C today and found 11 N 7 on the tank. LOS built car, built 3rd week of March puts it right in a few days before assembly the way it looks. Also, the tank is painted black (looks like factory as this car has a lot of originality to it.) I see someone already has the same numbers in the list. 11 N 7 would be 11th week of 67 night shift I believe? Just my 2 cents worth without inflation! Its always relevant. We are always trying to gather more info about dated parts. No problem. Glad I could be of some help. Kurt. You can add my 08A car to the mix. Tank was dated 1 70. I thought it was a replacement tank under warranty, as I did not know they started dating for 70 in Aug.
Good point, but since we don't know where the other 06A cars fit in, I'll just leave it as-is. I was planing to buy a new tank, but if I can find a date code I will try to save it of course. I have a big dent on it, around three inches in diameter and one inch deep. What's the best way to fix that dent? A little fuel in it and a match, or? Same date as mine. Which makes sense since your car built soon after mine. Nice. They just had a birthday. Mine should have been 8/21. Thats intersting. According to the 1969 calendar and NCRS mine was built (finished?) 8/19 which was a Tuesday and the tag reads 08C. Your car was built the same week according to the calendar, on 8/21 a Thursday, but then dated 08D? Maybe my car was waiting on parts? Well if I remember correctly our vin numbers are close, I don't think we compared body numbers, (yet). I'm going off what someone told me from CRG a few years ago. They said either 8/21 or 8/22, but more than likely 8/21. My body number is: Norwood 106672. What's yours? Let me know if I'm the one that's off... I don't have the NCRS sheet. Mine is 5,400 cars later. That seems like quite a few. I can't remember, how many did they average per day? I'd have to say that someone gave me a bad date way back when. Just realized we're hijacking this one... I'll bow out for now. Sorry gents. Just a heads up... I was a day off. Mine was final assembled Friday 8/22 (I always liked Fridays!). I broke down and got the NCRS report. My body number is 106672. Gus- try a radiator shop. The tank is soldered together. I was able to get my filler neck re-soldered by an old school radiator guy. My 1969 Z28 Camaro Vin # 124379L502278; build date of 09D 1968 has a gas tank date code of 5 69. Both are consistent with the previous data. Here's the latest compilation. Trends are obvious. Looks like that lines up Larry.. I knew it was original but I can't make much sense from the date code. Like most others I've seen it's an odd series of numbers for a 68 built car. Even using a Julian format it doesn't make sense, and Jan 9th, 1969 doesn't make sense either. But yeah like you said, it lines up with the other weird numbers for late 68 cars. Just thought I'd post because I don't see a 12D car on the list. guess my 04C was built early in the week? My 02A Norwood car has a tank date code 25 69 with the 5 upside down also,like one other member.I just had a chance to look for it today. Is it the 25 day of 1969? no, more like 25th week of the model year. no, more like 25th day of the model year. huh?? 25th WEEK of model year. Here's my stamp, 02D car. Also a pic of the drain that must've been there when I bought it back in '77. Sorry the pic is so small, the stamp is "28 69"
"69 01". Not sure what that means. Does it mean First week of 1969. I think the tank is original but not sure. I'm the second owner. how ever its read. Does the gas tank stamps mean that the gas tank is original or replaced? The point of this section, "Research Topics and Reports", is to get data from known original untampered with cars to determine if a pattern exists to understanding date codes and/or other information. If you go back a page, you will see a spread sheet where your tank date fits the collected data and can, therefore, be assumed as original to the car. New model cars generally would be introduced in September. Gearing up for production required parts made ahead of time. Your date, 10 69, or 10th week of production of model year is consistent with data. Production of gas tanks probably started in early or mid August (68) to meet demands of new model production. So say 1st week of August, count up 10 weeks, and that is when your tank was made or about a week before your car was made. Thank you. I looked at the spread sheet. Good to know gas tank is original to vehicle. My 02E LA car has 68 30 code. Pulled the one from my 69 to have repairs & the tank has 29 69 which can't be right for an 08E Norwood. I would need a 2 70 at least. Wonder if they made a 3 70? Hello all, new to this site. Great info. I think I have a tank not submitted yet, AND not listed in the compilation. I have a 10A LOS 68 L35/M40 car with a tank date code of 67 42. 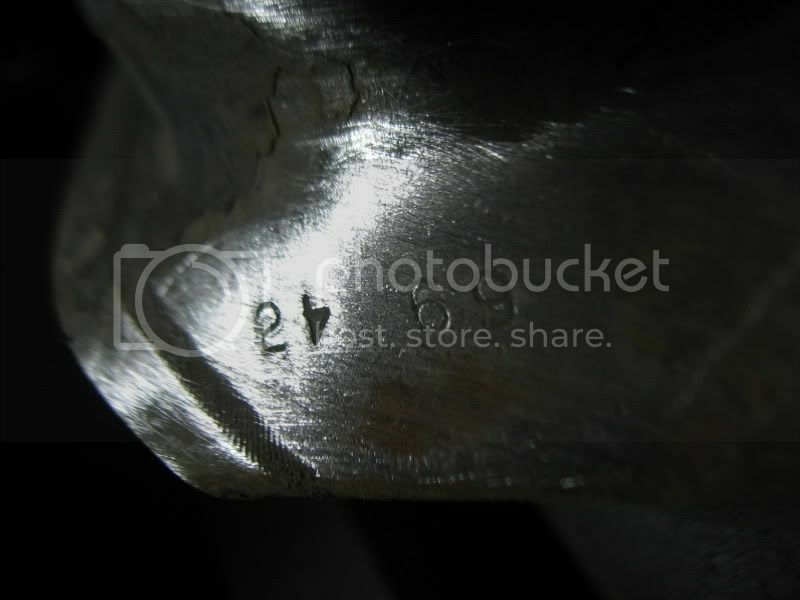 In addition, after cleaning it, I've discovered production marks on the right top side of a handwritten "5" over "6". If this is a duplicate, sorry. I may have missed it in reading the the 16 pages...….Thanks again, GREAT SITE!